This month’s challenge brought me back to territory I’ve covered in the past, although I was certainly due for a refresher. Being a San Francisco resident, this should’ve been a piece of cake for me, but it was not without its challenges. After guilt-tripping my DH into submission, I started the process over again, with 2 simultaneous starters. One was rye, the other the same mixture of whole wheat and einkorn. The rye surprisingly never really took off, although the mixture one did, and I used it to make rye bread fairly successfully. I used the Dutch oven method, which is supposed to yield a chewier, more sourdoughy crust, but did not do much except avoid a way-too-crunchy crust in my case. I suspect a little water added to the pot might have helped a bit more. Nevertheless, the rye turned out nice. It didn’t turn out huge and fluffy, but rye almost never does. It did taste good, and of course I didn’t wait the requisite 30 minutes for it to cool before cutting into it (I waited more like 30 seconds). Even my DH, who’s the pickiest eater on the planet and hates everything except white bread, thought it tasted pretty good. We were supposed to make an accompaniment, too. I made beet soup, going along with the Eastern European/Jewish theme. I don’t have a picture of them together, but dipping the bread in the soup was a winning combination. Great job!! Your sourdough looks beautiful!! 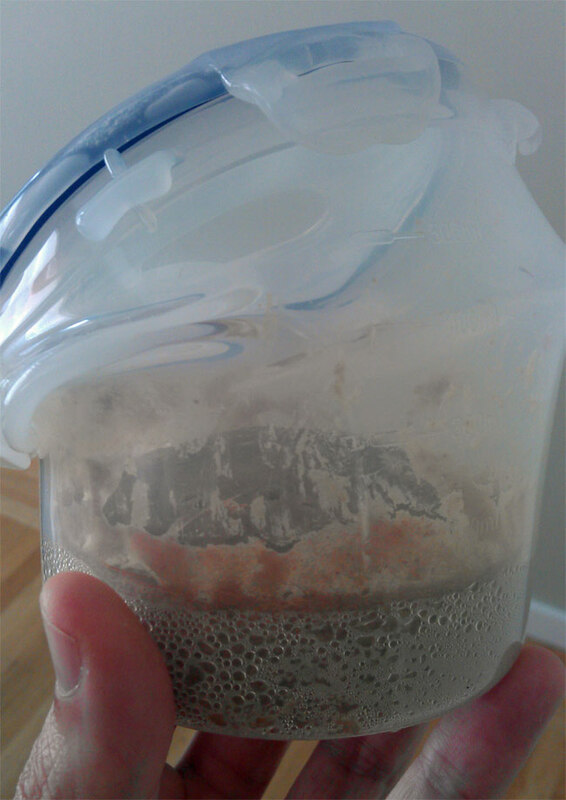 Aw I feel so sorry for your first starter – and your tupperware… But the finished loaf looks lovely, and I bet it was delicious with the soup. Victory from the jaws of defeat!